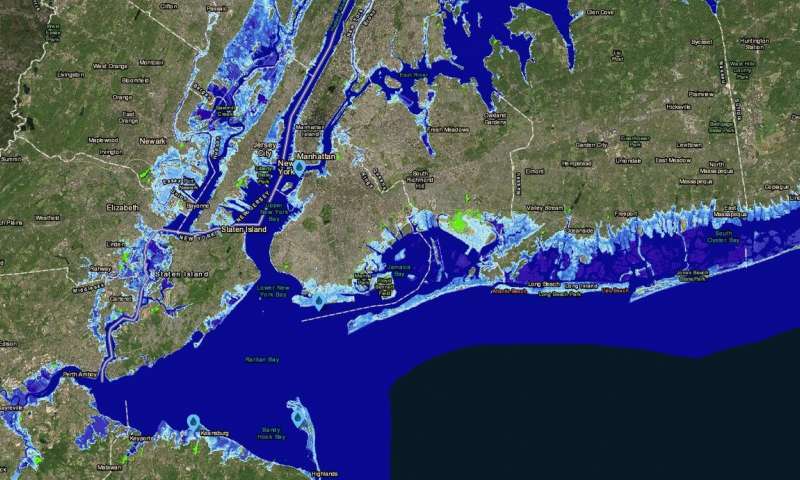 Oct. 8, 2018 (Phys.org) -- Global average sea-level could rise by nearly 8 feet (2.5 meters) by 2100 and 50 feet (15 meters) by 2300 if greenhouse gas emissions remain high and humanity proves unlucky, according to a review of sea-level change and projections by Rutgers and other scientists. Since the start of the century, global average sea-level has risen by about 0.2 feet (0.06 m). Under moderate emissions, central estimates of global average sea-level from different analyses range from 1.4 to 2.8 more feet (0.43 - 0.85 m) by 2100, 2.8 to 5.4 more feet (0.85 - 1.65 m) by 2150 and 6 to 14 feet (1.8 - 4.3 m) by 2300, according to the study, published in Annual Review of Environment and Resources. And with 11 percent of the world's 7.6 billion people living in areas less than 33 feet (10 m) above sea level, rising seas pose a major risk to coastal populations, economies, infrastructure and ecosystems around the world, the study says. From 2000 to 2050, global average sea-level will most likely rise about 6 to 10 inches, but is extremely unlikely to rise by more than 18 inches. Beyond 2050, projections are more sensitive to changes in greenhouse gas emissions and to the approaches for projecting sea-level change.